Last week I felt more than a twinge of regret for not having made the trip out to Chicago for the final three shows of the Grateful Dead’s “Fare Thee Well” tour. The band was born in 1965, the same year I was, and many of the Deadheads I met at Northwestern University, with whom I toured over the years, were headed back to our old stomping ground at Soldier Field. So when my editor asked me to check out one of the three live simulcasts of the shows from the Palace 9 Theater in South Burlington, I was more than game and picked the final show. To be honest, the Dead’s retirement tour hadn’t really registered on my radar. It’s been more than two decades since I went through the whole Grateful Dead mail-order ticket rigmarole and logged thousands of miles to party and dance in stadiums, fields and parking lots. And, nothing against the four surviving members — Bob Weir, Phil Lesh, Mickey Hart and Bill Kreutzman — but, for me, the Dead were laid to rest when Jerry Garcia died. That night in August 1995, I watched a red, white and blue meteorite shoot across the Texas sky, smoked a joint and hung up my tie-dye for good. Or so I thought. On Sunday night, I showed up at the Palace 9 parking lot slightly after 6 p.m. expecting … well, I’m not exactly sure what I expected. This is Vermont and home to not just aging Deadheads but aging Phishheads, too — Phish guitarist Trey Anastasio was an obvious choice to stand in for Garcia. So I presumed to find, if not the signature Deadhead traveling gypsy market/tailgate show, aka “Shakedown Street,” at least some parking-lot scene. Maybe “Sugar Magnolia” blaring from Dead-stickered hatchbacks, patchouli-drenched waifs hawking veggie burritos for gas money, blond kids with dreads and scruffy beards walking around with their index fingers pointing skyward, hoping for that “miracle” ticket for the last, sold-out show. Instead, the first obvious Deadheads I spotted were three men — one balding, the other two with gray beards and/or ponytail — who appeared to qualify for AARP memberships. As they navigated their way past three shiny Toyota Priuses (Priuii? ), then past a brand-new Corvette with a license plate that read, “PHAST,” the men smiled with glazed, bloodshot eyes and headed into the multiplex. Standing outside my own car, I peeled off the sweaty T-shirt I’d worn all day while boating on Lake Champlain, then donned a long-since-retired “Steal Your Face” tee I’d bought at the World Amphitheater in Tinley Park, Ill., on July 23, 1990. That was the last Dead show keyboardist Brent Mydland played before dying of a speedball overdose three days later. Suddenly, I caught a whiff of basement mold emanating from my shirt and thought: Crap! I’m living the ultimate aging Deadhead cliché! In the lobby, Palace 9 manager Donna Von Oehsen explained the meager crowd: Showtime was slated for 7 p.m. central time. The theater had sold out the previous two nights and added a second theater to accommodate more fans. On Sunday night, one theater was selling beer and hard cider, while the other was booze-free. Von Oehsen reported that during the two previous shows, Palace 9 owner Merrill Jarvis III sold 50-cent grilled-cheese sandwiches and bags of chips during intermission. So, were the Deadheads well-behaved? Back outside in the parking lot, an SUV parked not far from my car. As I waited for a friend to arrive, I struck up a conversation with its owners, Jessie and Bryan, a couple of Deadheads who were roughly my age. As we partied and listened to a live version of Garcia’s “That’s It for the Other One” blast from their car stereo, two separate groups of people approached us and asked if we could sell them some weed. (A third did the same during intermission.) 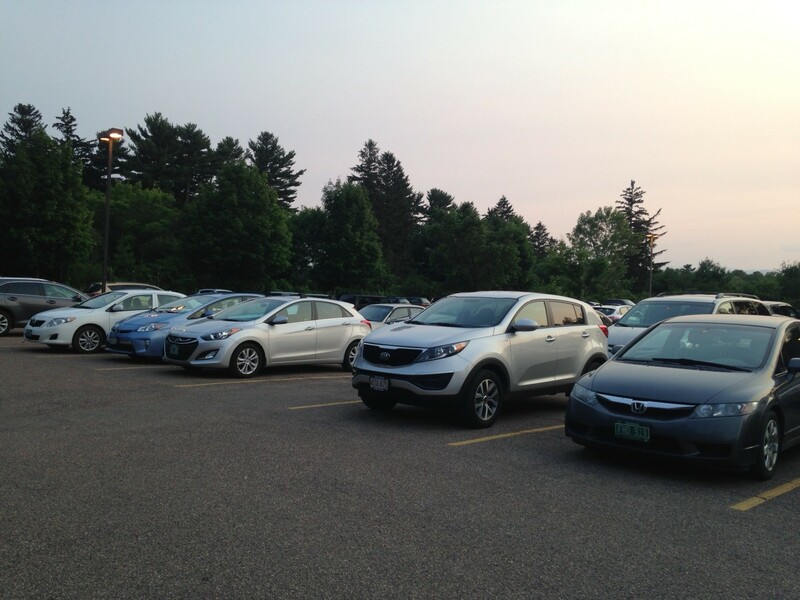 Though none of us looked especially stoner-like, we looked around and realized that, essentially, we were the South Burlington parking lot scene. My friends and I chose the drinking theater, where someone from Higher Ground’s security staff checked IDs at the door. As a twentysomething staffer stared just a bit too long at a silver-haired woman’s driver’s license, she looked at him with a bemused smile and said, “Yes, I’m really 63.” Embarrassed, he gave her a pink wristband and let her in. Inside, the theater was only three-quarters full and about 80 percent male, with more than touch of gray on their heads. Just before 8:30 p.m., Jarvis came out and introduced himself, invited the audience to dance in the aisles as much as they liked and told them there’d be $2 burgers and 50-cent grilled-cheese sandwiches outside during the set break. Soon, the movie screen went live and I realized this would be like no other Dead show I’d ever attended. The view slowly morphed through numerous camera angles ranging from sweeping aerial blimp shots of the record-breaking 71,000-person crowd, to high-def closeups of fans chatting, hugging, high-fiving and pre-gaming. There was something surreal and voyeuristic about watching this steamy preshow party from above while reclining in air-conditioned comfort 900 miles away. As the aerial cameras slowly swept over the vast sea of tie-dyes, I spotted no one I knew personally but everyone looked familiar. These were my people … just 20 years older. Clearly, Anastasio had the chops to pull off technical Jerry guitar licks, and Jeff Chimenti and Bruce Hornsby on keyboards showed off some nimble fingers indeed. Nevertheless, at times the band seemed to lack that special musical alchemy that made Dead shows of yore unique. Still, much of the magic endured, including the super-impressive percussive work of Kreutzman and Hart during “Drums,” which were augmented by intimate video closeups, psychedelic special effects and the loud-but-crystal-clear Dolby digital sound system at the Palace 9. 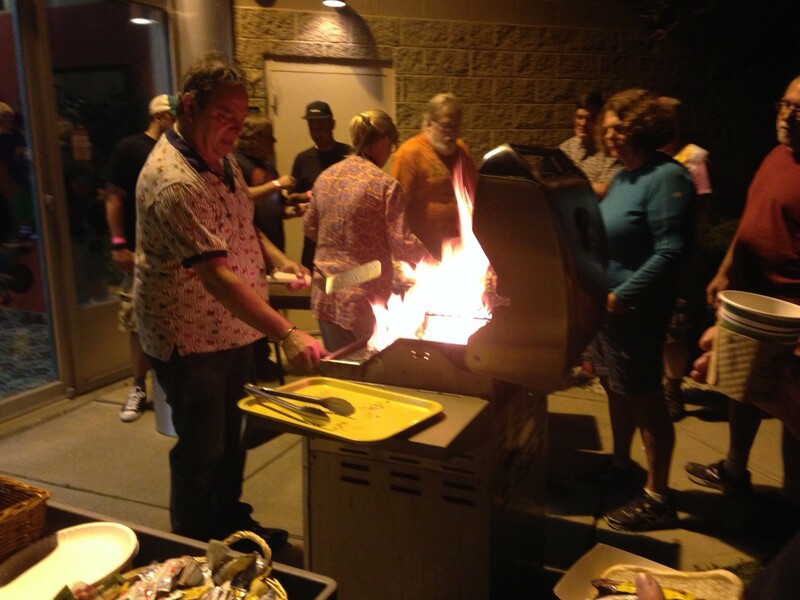 Palace 9 Theater owner Merrill Jarvis fires up the BBQ for hungry Deadheads — with $2 burgers! Throughout the show, many of the song titles and lyrics took on added poignancy, such as the first set’s “Built to Last,” the second set’s “Unbroken Chain” and the line from “Truckin’” that goes, “What a long strange trip it’s been.” When the second set closed with the audience chanting the line, “You know our love will not fade away,” the cross-stadium refrain soon wobbled out of time, like a top slowly losing its spin. When it was all over, bassist Lesh, always a class act, came out and thanked the crowd, then urged them to become organ donors. The guy who saved Lesh's life with a liver transplant in 1998 saved seven other lives as well, Lesh said. Next, Hart came out and offered his own parting words. 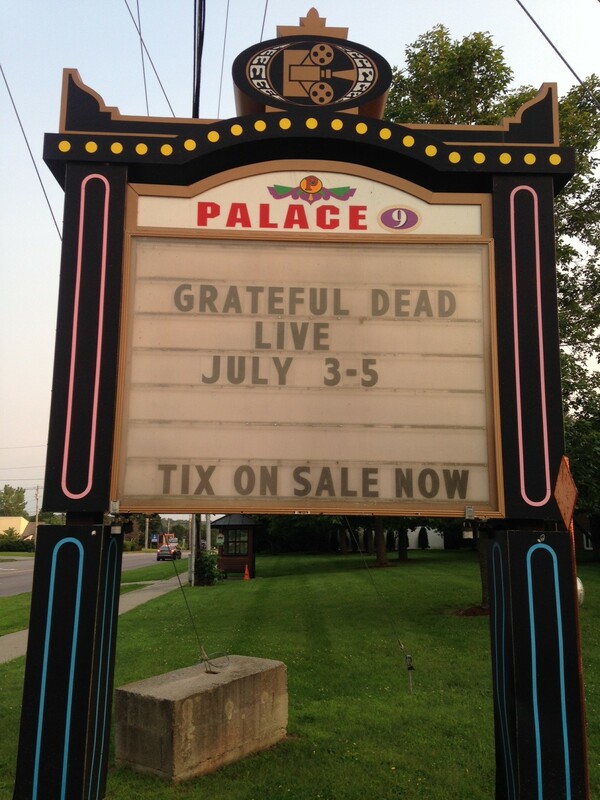 I left the Palace 9 shortly after 1:30 a.m. to the lilting strains of Garcia’s “Black Muddy River,” the last song I ever saw him perform live. Only the chatter of a pay-per-view interviewer asking band members the most inane question imaginable prompted folks to leave the theater. Certainly, Jarvis seemed in no hurry for the party to end. I emerged into a nearly empty parking lot, jumped in my car and was homebound in less time than it probably took my in-attendance friends to reach the stadium restrooms. Not to overuse the expression, but the experience of leaving a Dead show into quiet suburban South Burlington was simply surreal. Then I overheard two former strangers say good-bye to each other in quintessential Dead-show fashion. As I drove away, all I could think was, Thank you for a real good time.